Phoenix, AZ (July 13,2018) – August is coming, and parents know what this means, it’s back to school time! Lerner and Rowe Gives Back recognizes the importance of education and supports it every chance they get. 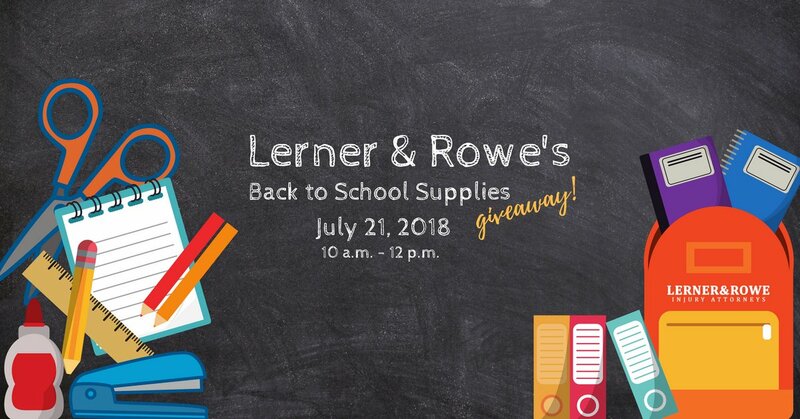 This year, Lerner and Rowe will provide school district-approved backpacks and school supplies to elementary school aged children* at a Back to School Giveaway on July 21st, from 10 a.m. to noon at their South Phoenix location (52 E Baseline, AZ 85042). An exciting morning of activities are planned to include Mr. Softie, popcorn, cotton candy and even a jolly clown making favorite balloon animals. Children must be present and accompanied by an adult. *Limited supplies available as the backpacks will be given out on a first-come first-serve basis! Make sure you join us on the 21st! We look forward to seeing you there. Please reach out to Cindy Ernst with any questions via email at [email protected] or by calling 602-977-1900. Lerner and Rowe help clients receive the justice they deserve. Whether it’s after a car wreck, or dangerous product injury, you can trust our firm. For additional information about Lerner and Rowe’s Phoenix personal injury attorneys call 602-977-1900. To learn more about the criminal defense and bankruptcy legal services offered by their partner law firm Lerner and Rowe Law Group, visit lernerandrowelawgroup.com or call (602) 667-7777. Need help filing an application or appeal for Social Security benefits? Contact the law firm’s other legal partners at Social Security Disability Advocates by calling (602) 952-3200 or online at socialsecuritydisabilityadvocatesusa.com. Follow Lerner and Rowe on Twitter or also, like their Facebook page. Visit lernerandrowegivesback.com to learn more about the community services that the lawyers and legal support team of Lerner and Rowe actively support.